The George Washington Bridge, spanning the Hudson River between Manhattan and Fort Lee, New Jersey. The view is from the New York side, looking slightly upstream. Note the suspension cables as they enter the anchor on the New York side. The Palisades provides anchoring on the New Jersey side. When we think of this suspension bridge, or suspension bridges generally, we're less aware of the anchoring than we are of the span. That is somewhat ironic, because the two towers of this bridge contain just over 43,000 tons of steelwork, whereas the New York anchor alone contains over 260,000 tons of masonry. In almost every sense that matters, the anchors of a suspension bridge are where the action is. Without them, all else fails. So it is with meetings. Many of the elements that make a meeting work happen outside the meeting itself. Many of the elements that drive meeting costs, likewise, happen outside the meeting itself. 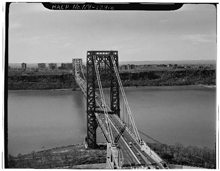 More about the George Washington Bridge. Photo from the U.S. Library of Congress Prints and Photographs Division. Last time, we examined some foundational costs of meetings — invitations, the facility, and transport to and from. Let's now examine preparation activities. They aren't free, and some aren't cheap. When we reschedule meetings not yet held, we might poll the attendees, who must then respond to the poll. Some might have to reschedule commitments of their own to attend the newly rescheduled meeting. A cascade of little tasks can form, and since it potentially affects all attendees, its cost can be significant, though we rarely measure it or even estimate it. At first, one might think that there's a significant cost for reading minutes, because everyone has to do it. But hardly anybody reads minutes. On the other hand, someone does take minutes, writes them up, and posts them. And if there's a podcast, someone has to do that. Because scribing is usually a one-person job, we think of it as low-cost. But we lose access to this person's contributions during the meeting, because it's difficult to take minutes and participate fully. That lost access can have expensive consequences. You can save time on preparing agendas by not having them, but the cost is enormous, because meetings take longer and accomplish less — much of it wrong. So you have to do an agenda, but you can save time by not asking anyone for contributions. Nah, that doesn't work so well either, because meeting participants together compile agendas better than any one person can alone. So you end up having to poll people for contributions, and whenever you need to involve everyone in anything, costs climb. The costs in this case are worth it. They're just not zero. Really not zero. total cost can be significantFor written bios, attendees must write them, and someone has to compile them or provide a place where they can be posted. For recorded intros, attendees must plan, write, and deliver them. Some will even rehearse. It all takes time, and since everyone gets involved, the time taken can be significant. If materials accompany the meeting, the time to prepare them is usually accounted for. But the time to assemble them into distribution packages and get them delivered might not be. Such efforts usually get allocated to a bulk account that covers many different groups, if they are accounted for at all. The more often you meet, the more of these tasks you have. Find a way to meet less often. Would you like to see your comments posted here? rbrenplnGFNDqnjRRFbJKner@ChacwYFpXhnAAUJXfXkmoCanyon.comSend me your comments by email, or by Web form. I offer email and telephone coaching at both corporate and individual rates. Contact Rick for details at rbrenaIVTNnKpRYjNVbtzner@ChacOlpXrxXEFHLWcABeoCanyon.com or (650) 787-6475, or toll-free in the continental US at (866) 378-5470.